Internet connection speeds could be tens of times faster than they currently are, thanks to research by University of Manchester scientists using wonder material graphene. Writing in the journal Nature Communications, a collaboration between the Universities of Manchester and Cambridge, which includes Nobel Prize winning scientists Professor Andre Geim and Professor Kostya Novoselov, has discovered a crucial recipe for improving characteristics of graphene devices for use as photodetectors in future high-speed optical communications. By combining graphene with metallic nanostructures, they show a twentyfold enhancement in harvesting light by graphene, which paves the way for advances in high-speed internet and other communications. By putting two closely-spaced metallic wires on top of graphene and shining light on this structure, researchers previously showed that this generates electric power. This simple device presents an elementary solar cell. More importantly for applications, such graphene devices can be incredibly fast, tens and potentially hundred times faster than communication rates in the fastest internet cables, which is due to the unique nature of electrons in graphene, their high mobility and high velocity. The major stumbling block towards practical applications for these otherwise very promising devices has so far been their low efficiency. The problem is that graphene  the thinnest material in the world  absorbs little light, approximately only 3%, with the rest going through without contributing to the electrical power. The Manchester researchers have solved the problems by combining graphene with tiny metallic structures, specially arranged on top of graphene. These so-called plasmonic nanostructures have dramatically enhanced the optical electric field felt by graphene and effectively concentrated light within the one-atom-thick carbon layer. By using the plasmonic enhancement, the light-harvesting performance of graphene was boosted by twenty times, without sacrificing any of its speed. The future efficiency can be improved even further. Dr Alexander Grigorenko, an expert in plasmonics and a leading member of the team, said: "Graphene seems a natural companion for plasmonics. We expected that plasmonic nanostructures could improve the efficiency of graphene-based devices but it has come as a pleasant surprise that the improvements can be so dramatic." Professor Novoselov added: "The technology of graphene production matures day-by-day, which has an immediate impact both on the type of exciting physics which we find in this material, and on the feasibility and the range of possible applications. "Many leading electronics companies consider graphene for the next generation of devices. This work certainly boosts graphene's chances even further." Professor Andrea Ferrari, from the Cambridge Engineering Department, who lead the Cambridge effort in the collaboration, said "So far, the main focus of graphene research has been on fundamental physics and electronic devices. "These results show its great potential in the fields of photonics and optoelectronics, where the combination of its unique optical and electronic properties with plasmonic nanostructures, can be fully exploited, even in the absence of a bandgap, in a variety of useful devices, such as solar cells and photodetectors"
It is a wonder material that possesses a large number of unique properties and is currently considered in many new technologies. The world's thinnest material was discovered at The University of Manchester in 2004, which was acknowledged by the 2010 Nobel Prize in Physics awarded to Geim and Novoselov for their "groundbreaking experiments regarding the two-dimensional material graphene". Oh graphene, you so crazy. It's also thin enough to slice bread. Is there anything graphene can't do? Perhaps the ideal substrate for nuerons as well. I have a sneaky feeling graphene will be the basis for the first successful brain-computer interfaces. They didnt explain exactly how it would make fiber faster, we aren't shuffling electrons down the fiber so their speed isn't an issue. faster electron transfer in the what-would-be receiver would equal faster "high" states thus you can increase your transmission frequency. more on/off's per period means faster data throughput. I would imagine the nano scale characteristics would also lend to incredibly low power consumption? The breakthrough is the ability to quickly turn light into electrons. This could also be very important for future optical processing as well. A Guy Named Mark hit the nail on the head!!!! The bottlenecks in optic fibre communications are the optic to elctronic coupler. Sure photons can travel at the speed of light, but as soon as those photons need decoding into an electronic signal, the whole process bogs right down. The same applies for the production of the optic signal in the first place. So speeding up the modulation electronics and demodulation electronics will instantly give increased bandwidth, without changing your optic fibre infrastructure at all!!! This is how most fibre "speed ups" have been done so far. This is the first to utilise graphene in such a novel way as to get massive improvements in speed. 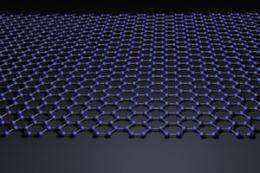 graphene is replacing with silicon. The article says pure graphene is about 3% efficient. Also, "the light-harvesting performance of graphene was boosted by twenty times"
Plus, "The future efficiency can be improved even further." So this device is (better than) 60% efficient in turning light energy into electricity? And that's not the headline? Is this only for photons in a narrow range of wavelengths? Is the current capacity miniscule? Is it incredibly expensive to produce this on a large scale? Edit: The linked abstract reports, "Additionally, wavelength and polarization selectivity can be achieved by employing nanostructures of different geometries." but bandwidth and current capacity and $/watt remain unclear (at least to me because I will not spend $32 to buy the whole pdf).